Leasing for Solar Power- Paying for solar power can often be the most overwhelming, complicated part of putting in a solar system. A single system usually costs between $15,000 to $30,000. Most people don’t have this kind of money just lying around to be put into use. Taking out a lease, like for most other big investments, sounds stressful. However, it’s not as scary and confusing as it sounds. With leasing solar power, a company will agree to pay for the initial panels and upkeep of them. The job of the leaser is to pay smaller amounts to the solar power leasing company. This takes some financial pressure off of the homeowner if the financing behind installing a solar system is the biggest concern. Some well known solar power leasing companies are Sunrun, sPower, Sungevity, and SunEdison. Loans for Solar Power- Another option to finance solar power is through taking out a loan. With loans, the complete cost of the solar power system has to be paid immediately to whatever manufacturer or company a homeowner is receiving the entire solar system through. So, for example, if you are receiving the solar system through Sunrun, you may be paying your loan back to a federal government program. 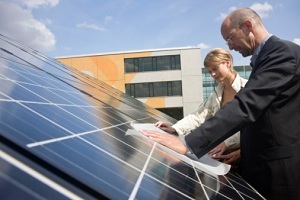 One example of a federal government program that assists with solar power loans is PACE. PACE stands for Property Assessed Clean Energy Programs, and runs through a certain area (city or town) loaning the amount of money the solar system costs to the homeowner. In return, the homeowner pays the system back through higher property taxes. This way, the city or town is assisting in environmentally progressive programs, while a homeowner reaps the benefits through needed financing. Mortgage for Solar Power- One way to finance solar power is through a mortgage. Most solar power based mortgages best work when intertwined in the beginning process of mortgaging a home. Home mortgaging programs, like Fannie Mae, will analyze the energy efficiency a home you are thinking of buying has initially. It will then decipher what modifications will in the end benefit the home. Once these modifications are decided, the mortgages amount is agreed upon. So, if a potential homeowner is planning on mortgaging $300,000 for a $350,000 home, and paying $50,000 out of pocket, the numbers will shift. Instead of mortgaging $300,000, a buyer can mortgage $335,000 through a solar power mortgaging company. The extra $35,000 of the mortgage will go towards making the home more energy efficient and environmentally conscious. Some of these modifications may come in the form of installing a full solar power system and replacing other electronic products with more green options. Energy efficient mortgaging not only helps the environment, but, ultimately, will be a prime investment for the homeowner. Financing behind solar power systems may seem complicated and simply money consuming. However, there are reliable companies giving options to lease, loan, or mortgage solar power systems. They will give a current or potential homeowner the opportunity to invest in solar power, positively affecting the energy efficiency of the home and the quality of the environment.